New Delhi, March 6: Prime Minister Narendra Modi, who is in Tamil Nadu, to unveil a slew of rail and road projects announced that the Chennai Central Station will be renamed after the AIADMK founder MG Ramachandran. "We are also seriously thinking about ensuring that flights to and from Tamil Nadu have in-flight announcements in Tamil," the PM said. Unveiling infrastructure projects worth several crores of rupees in the southern state, Modi said the projects would reduce carbon footprint and cut down on travel time. 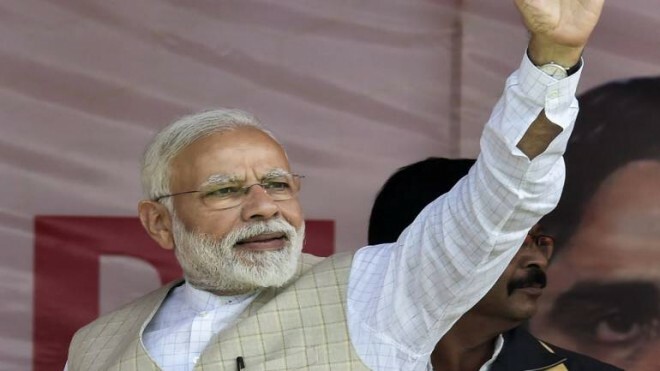 At a function in Kilambakkam near Chennai, Modi unveiled road projects in Vellore, Thiruvannamalai, Villupuram and Tirupur districts through video conferencing. Chief Minister K Palaniswami and Deputy Chief Minister O Panneerselvam were among those present on the occasion. Modi also laid foundation stones for five national highways projects which will pass through Villupuram, Cuddalore, Ariyalur, Thanjavur, Tiruvarur, Vellore and Kancheepuram districts. The highway projects, which include four-lane and six-lane, is worth Rs 5,010 crore.